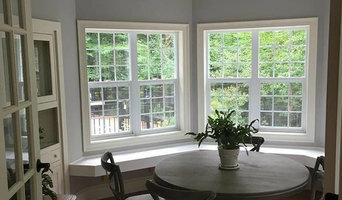 Donald P. Blake Jr., Inc.
Our company has offered experienced and reliable contracting services in the Lamoille County area since 1985. We continue to provide quality work and offer a variety of services for new construction, renovations and property management. Our employees are skilled in working together as a team to provide the best and to meet the expectations of each project we schedule. We believe that by working as a team we have the ability to expand and improve our capabilities as a company. We strive to continually improve the quality and value of our work. Roundtree is a general contracting firm that has had the privilege of building some of the finest homes in Vermont for wonderful owners. We work with leading architects, both local and based throughout the country, to bring unmatched craftsmanship, unrivaled attention to detail and the best that building science has taught us about performance to all of our projects. We love our business of creating shelter designed to last. Our goal is to have our performance exceed our clients expectations. In order to succeed at this, we must earn their trust through transparency, honesty, and constant communication. We know that the quality of our work will speak for itself, both through the precision of its execution, and the performance of the product over time. We are committed members of the green building movement and have been building homes that embody its principles for years before it was given a name. We are members of the U.S. Green Building Council, and work with Efficiency Vermont, Vermont Energy Investment Corporation, LEED for Homes, & Vermont Energy Star Homes. Red House is a full-service, employee-owned building company located in Vermont's Champlain Valley. 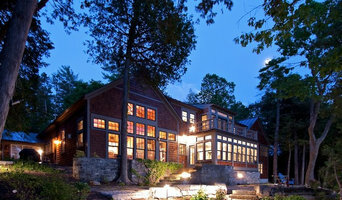 We specialize in custom residential construction, renovation, and historic restoration. Over the past 25 years, Gordon Dixon Construction has built more than 50 homes for families of all sizes and preferences. Though our roots are in the Vermont vernacular style, our projects have evolved to include a variety of styles, ranging from classic Vermont farmhouses to large contemporary timber-framed homes. We have also completed several commercial award winning projects including an office and medical building, an athletic facility, and a restaurant/lodge. Gordon Dixon Construction was started in 1991, when my wife, Robin and I, were in search of the ultimate Vermont farmhouse for our own home. We built our own home, blending the traditional design and details of an old farmhouse with the functionality of a more open interior. Our ideas and design became the Innisfree house. Robin and I still work together along with our on site crew of foremen and carpenters. We have lived in Stowe since 1991 and have three children. Building a home is a deeply personal experience. We maintain open lines of communication with our clients throughout the process to ensure that the finished product meets their needs and expectations. Our seasoned team of project managers, foremen, carpenters, and office staff works closely together to build quality homes that we know our customers will enjoy for years to come. Inland Building Co. has been listening to clients' needs for 18 years, delivering building and renovation solutions in Vermont, Massachusetts, and elsewhere on the East Coast. 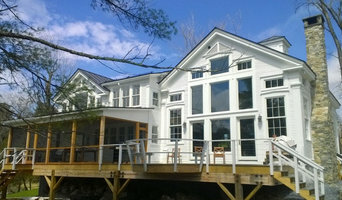 Shelterwood Construction is a high performance building company based in the Mad River Valley, Vermont. Shelterwood Construction focuses on projects that have close collaboration with forward thinking clients, designers, and architects. We specialize in crafting high quality homes that will stand the test of time. We assemble the finest craftspeople for each project. 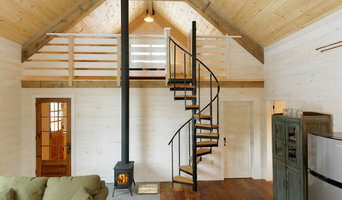 Our specialty is crafting the finest certified Passive Houses in Vermont. We take pride in our work and so do our clients. We take Pride in High Quality Work with other Licensed tradesmen. Residential and Commercial Contracting. AW Clark Jr. & Son Inc. DBA - AW Clark Builders was started in 1954 by the late Allen W. Clark Jr. and has been operated continuously since. Since day one Quality was always at the forefront of every projects. Allen's theory was that if he built quality homes and built a reputation of that, it was the best advertising money could buy. Now with the 3rd generation of family in the business, Allen's son Tom, and Tom's son Brooks still provide quality workmanship in every project. Beacon Hill Builders has the ability and immense talent to execute any project. Whether a custom home or larger commercial project, we have the resources to provide exceptional craftsmanship and deliver your project on time, and on budget. For over ten years, we have been building our reputation as a company with extraordinary attention to detail; while taking great pride in all that we do. With unrivaled client service and a passion for construction, we have established ourselves as a company you can depend on and trust, for years to come. Sticks and Stones Construction LLC specializes in both residential and commercial construction. 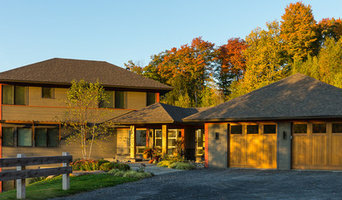 We work on projects of all sizes throughout Central Vermont We are a client driven construction company, working on a wide range of projects from custom home building, remodeling, additions and renovations to pre-construction consulting, design and planning, general contracting, detailed estimating services and accurate bidding. We are committed to bringing the highest level of building practices, project management and customer service to our clients. We collaborate with owners, architects, engineers and trade contractors to achieve individual project goals in the smartest and most efficient ways possible. We have developed a strong reputation for delivering quality craftsmanship while maintaining a high level of client satisfaction through timely and effective communication and efficient project management. It is our goal to work with clients to develop a project that meets your budgetary needs, priorities and aesthetic preferences. As a PHIUS Passive House Certified Company, we strive to meet or exceed the highest standards in energy efficient construction. We are RRP Lead Safe Certified and will ensure that all lead safety guidelines are followed. Our company is committed to using the most health conscious and sustainable materials possible. Please contact us to discuss your project. We are happy to provide references upon request.